In January of 2007 the 4Real board considered the opening of a new forum called Hidden Treasure, a forum dedicated to Mary, the Mother of God. This forum was begun to support Marian devotion by encouraging prayer, friendship, and discussing the virtues of Our Lady. Our Heavenly Mother brought things together so that the new forum was up and running on January 21st of that year. The moderators discovered that this was the feast in honor of Our Lady of Altagracia. Asking Our Lady to lead the way, the 4Real board decided to go with the title from the Dominican Republic of Our Lady of Altagracia unless she directed otherwise. As we learned more about this beautiful image and the devotion behind it, we saw the loving hand of Our Lady, who suggested this fitting title as the patroness for 4Real. One of the first confirmations that Our Lady of Altagracia had chosen us was the prominence Our Lady of Altagracia has in discussion here through the book Gift of Gracias featured in Cay Gibson's Catholic Mosaic. 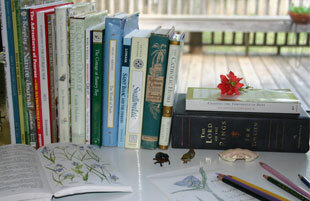 Cay's books have always been popular with the participants at 4Real. The beautiful image shows Mary wearing a fine robe decorated with pearls as a sign of her Queenship. The 4Real Board belongs to Our Lady; she is truly the Queen here. 4Real strives to honor and respect husbands and their role in the education of children and family life. 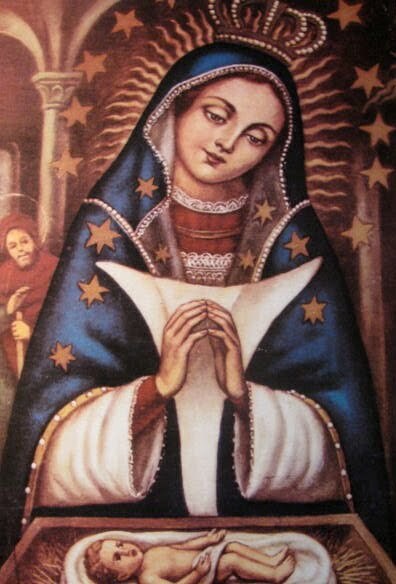 This image of Our Lady of Altagracia is blessed by the presence of St. Joseph the foster Father of Jesus. We see St. Joseph shielding a candle symbolic of his role as protector of the Light of the World. His hand appears open towards Mary in loving honor. Mary is shown with Jesus, dressed in swaddling clothes, lying in the manger. Our Lady of Altagracia is an image of the Holy Family and points our attention to the many years spent in the Hidden Life at Nazareth, a meditation which remains near and dear to the hearts of Mothers at home. Baby Jesus has His gaze fixed on Mary while His hand is also opened toward Mary. He bestows upon Her abundant grace so that she may Mother her many children who turn to her in their needs. Our Lady's prayerful attitude, head slightly inclined and hands folded in prayer, sets forth the example which we Catholic, homeschooling mothers wish to emulate - a prayerful reverence toward Jesus and the interior life as we serve our children in their daily needs and are conscious of the role of our husbands. The 4Real Board is grateful that Our Lady of Altagracia chose to become our patroness. May she continue to pray for us and set her example ever before our eyes.